Master Witch: A mastery of witchcraft increases max HP and number of enemies Polymorphed. Increase max HP by 5000 and targets Polymorphed by 1. Horn of Valhalla: At start of battle, blow the Horn of Valhalla to increase team's Damage Reduction and Defense. Increase DR by 10% and DEF by 500 for 2 turns. Dark Embrace: The cold embrace of darkness imbues the frost blade with increased damage and physical attack power. Increase DMG by 20%, and in battle increase PATK by 500. Blade Aura: Perfection of the sword greatly increases Attack and Hit. Passive: Increase PATK by 750 and HIT by 1000. Awaken your Heroes now, unleashing their true potential! 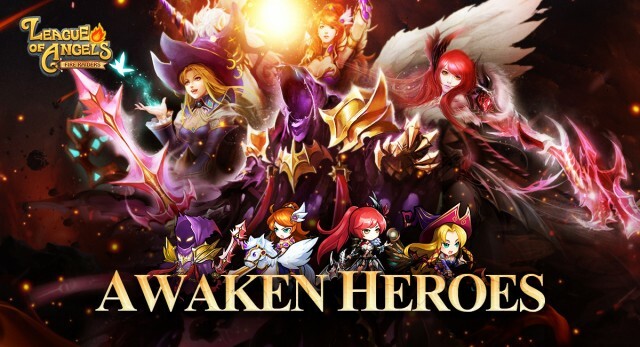 Follow official Facebook fanpage of League of Angels - Fire Raiders to tell what you think about these new awakened heroes and get the latest news about the Awakening materials for your Heroes.